The Peace Ball was one of the hottest tickets in town during the inauguration. Of all the inaugural balls throughout the weekend, one of the hottest tickets was to the star-studded Peace Ball at the awe-inspiring National Museum of African American History and Culture. While the crowd gained energy from the passion displayed on stage, the shoulder-to-shoulder arrangement of bodies filling the museum’s Heritage Hall was a motivating sight in itself. 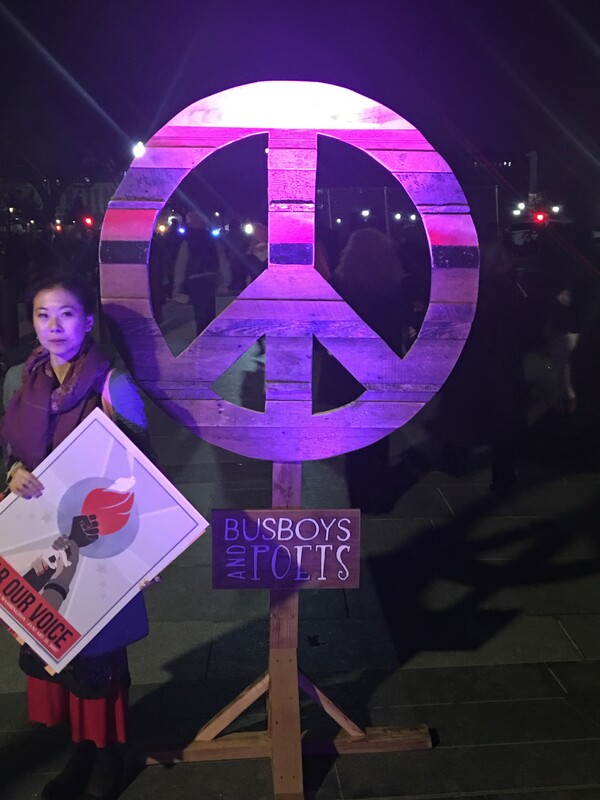 People of all colors and backgrounds danced and laughed in exuberance as the night transitioned into the early moments of Inauguration Friday, without any trace of anxiety or dampened spirits. As patrons emptied from charter busses queued alongside the Washington Monument, they spilled in from the swirling lines outside; lines that remained steady beyond midnight. After scanning tickets ranging from $150 to well over $300, guests gained admittance inside to the, at first, dark and crunched hallway that led directly to a bright and multi-colored array of decorations, people and fun. At an especially captivating moment, a densely packed dance floor jolted to life with Montell Jordan’s infamous “This Is How We Do It” and then Cameo’s legendary “Candy.” The multicultural scene looked straight from the song’s video, only packaged in formal tuxes and exquisite gowns, all semi-drenched in joyful perspiration. “There’s no other place to be tonight,” one man in his evening attire said as he offered a friendly and sincere “peace to you,” walking from one of the many open bars positioned throughout the building. “In this resistance we need art, music and creativity,” Davis said in her closing, which agilely served as both a guiding tool of wisdom to follow, and an introduction to the ultimate performance of the night – Solange. We were told that “Solange will be one creating the battle cries” of the resistance. Then the lights immediately softened and the air cooled as Solange and her ensemble commenced to pour out smooth, flowing R&B to the by now tight and frustrated mass of black tie-clad attendees. The backdrop of the stage mirrored an ever-fluctuating horizon, floating from dazzling pinks and oranges to serene hues of docent blues, as if leading through a hopeful resistance at times fiery, at times lulled, but always evolving to end inevitably in peace. As Solange crooned her popular “Cranes in the Sky,” the song momentarily reminded everyone of what was in store for tomorrow. Yet the receiving group seemed to be clearly stilled, undismayed, ready to take on whatever challenges were ahead. Some late arrivers may have missed Esperanza Spalding’s musical selection with accompanying singers from Afro Blue, a jazz ensemble from local Howard University. It was extremely hard to get into the museum at the hour between 9 and 10 p.m.
As throngs of people began to disperse and make their respective ways to coat checks, newly discovered friends and exit doors begrudgingly, the same commitment uttered by Roberts was plainly plastered on the smiling faces of each departing person. One by one, people said hello and goodbye as they slowly disappeared into small groups headed home. Stepping out the door, a young woman asked me to take her picture. In seconds, the geniality ushered in by the night’s festivities greeted me. Her name was Rachel Nyanjom. After a few rounds of introduction, she candidly shared her thoughts on the political climate. As she spoke, people walked out the museum to the reassuring sound of Kendrick Lamar’s “Alright.” In it was a palpable and inextinguishable feeling that indeed we all will be alright, no matter what the next four years may bring. Although Andy Shallal, owner of Busboys and Poets, may have originally intended for the gala to be a nonpartisan event and planned it before Election Day, it imparted a message of strength, endurance and courage to many attendees dissatisfied by the transfer of power to happen in mere hours. Girding it all however was a sense of peace; a sense that tactfully enabled a hopeful and unwavering resistance. While respectful to the process and changing of the guard, this sensation warranted a newfound vigor to safeguard the progress already made and that which was still to come. At night’s end, I departed up cold, blockaded 14th Street Northwest to hail a cab. Holding my party favors securely — “Women’s March on Washington” posters by artist Shepard Fairey — I was impressed with one lasting anecdote. Nyanjom said that Angela Davis told people to “shake hands with one another,” earlier in the night, and that a woman on the elevator actually introduced herself. “That is how peace starts,” Nyanjom told me. A.B. Brown Jr. is a writer and editor for 101Magazine.net.